A cherry smash. Doesn’t that look frosty? The Cherry Smash is a modern take on an anitquated classic: the smash. Jerry Thomas says of them “This beverage is simply a julep on a small plan.” Ouch. It is julep-like, but has the addition of fresh fruits, and can be made with gin, brandy, or whiskey. 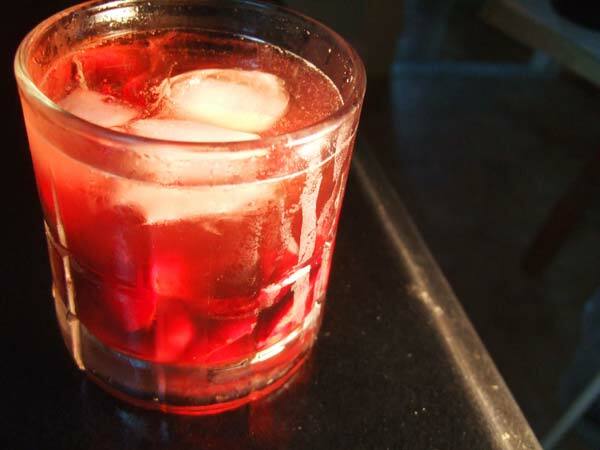 Although the Cherry Smash appears in cocktail historian David Wondrich’s book Imbibe!, the version comes from Food & Wine magazine. It’s simple, delicious, and worth purchasing a few special ingredients. In a rocks glass, gently muddle the cherries to release some of their juices. Fill the glass with ice, add the bourbon and Cherry Heering and stir well. Top with club soda, stir again and serve. I had to make some major substitutions when creating this drink. I had Maraschino liqour, not Cherry Heering. I couldn’t find sour cherries at my local grocery store, despite having seen them all over Manhattan. And the bodega was out of club soda, so I used seltzer water. All things considered, the drink still came out pretty good, but I would give it another go with the proper ingredients. My roommate pointed out that the cherries look kinda gross by the time you get to the bottom of the drink — all bloated like a corpse — but they taste magnificent. UPDATE: I have it on good authority that this drink is best with Cherry Heering. Sometimes what you substitute makes a better product… I can’t help to think that maraschino is far better than cherry herring!!! Love sour cherries so can’t wait to try this when I get back!!! Well… I agree with your post!